My War Gone By, I Miss It So. Anthony Loyd. New York, NY: Grove Press, 1999. The allure of combat and war as the medium to find oneself and something missing in life has existed since the dawn of humanity. 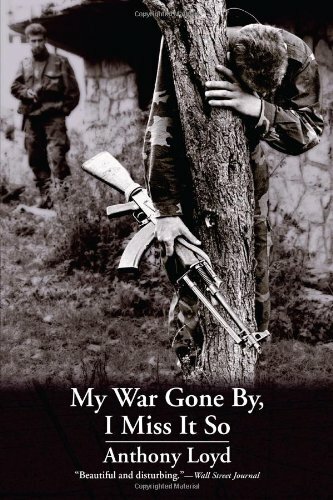 Anthony Loyd’s My War Gone By, I Miss It So is part autobiography and part war correspondent memoir. Loyd artistically intertwines his search for his place in the world with his experiences in Bosnia and Chechnya. Eventually he finds himself, only after getting lost along the way, while experiencing the worst of humanity. The book focuses on his interactions with multiple characters in Bosnia and Chechnya and a small group of friends in London. His friends in London lack the ability to sympathize, or grasp Loyd’s internal conflict, with being home and away from the powerful emotional pull of war. Through the ages, people have struggled to find their place in the world taking different journeys on their path of life. The allure of combat and war as the medium to find oneself and something missing in life has existed since the dawn of humanity. Loyd’s journey is a harbinger for a generation of Westerners who have known war for over two decades. His internal struggles with his place in life had him looking to the military for answers. Eventually, he found what he was looking for in combat as a war correspondent, but it came at a price. When home, Loyd struggled to integrate and follow the realities of his life in London with the horrors he saw and experienced in both Bosnia and Chechnya. “My emotions had lost their definition. It was not that I no longer missed those close to me, merely that I felt so detached as to be suddenly unaware of what I wanted or care about outside the immediate realm of Bosnia.” Loyd experienced the raw emotions and love affair of war while simultaneously losing the ability to relate to friends who lack the ability to sympathize. The inability to initially comprehend and process the emotions generated during war led Loyd along a dangerous path, but one he eventually managed to navigate successfully. Many others are not as lucky. Loyd’s internal struggles to process the powerful emotions produced from war pulled him down a self-destructive path where he was eventually “..hunched inside the darkness, alone with thoughts of suicide.” The inability to initially comprehend and process the emotions generated during war led Loyd along a dangerous path, but one he eventually managed to navigate successfully. Many others are not as lucky. Daily, people struggle with their own journey through the horror of war but, “too many like me, threw themselves into the waves and never looked back until the undertow kicked in.” Loyd’s journey relates to all those who have firsthand experience with war, as well as their loved ones, and the struggles to rebuild some resemblance of their past life that exists in stark contrast to their experiences. My War Gone By, I Miss It So is a story about Loyd’s struggle of emotional turmoil and his abuse of alcohol and heroin becoming the solution. It identifies with a generation that has experienced the horrors of war while figuring out their place when they return to their old world and coping with the enduring memories. His candid struggles with drug addiction offer the perfect companion to Loyd’s struggle with his addiction to war. The deep, personal struggles when home, and how alcohol soon moved to heroin as the coping mechanism to process his emotions, allow the reader to feel the internal struggles and conflict. This emotional conflict is not unique to Loyd. His ability to be so candid, and describe his journey with such clarity, pulls the reader into a shadowy world many are unfamiliar with and lack the ability to comprehend. Beyond the field of war, the book will additionally relate to readers who struggle with substance abuse as a coping mechanism for their respective problems. My War Gone By, I Miss It So offers a raw, candid description into the horrors of ethnic genocide. Loyd’s graphic descriptions of the ethnic cleansing in Bosnia, allow the reader a glimpse through a window into a world many cannot comprehend. Through this window, the reader sees and attempts to grasp the emotional turmoil that Loyd struggles through as his mind attempts to understand and catalog the brutalities of humanity against itself. Loyd masterfully illustrates the sheer hatred displayed by humanity and the brutality humans are capable of inflicting on each other. Jacob Helgestad is an officer in the Army National Guard. The opinions expressed here are the author’s and do not represent the official position of the U.S. Army, Department of Defense, or the U.S. Government. Loyd, Anthony. (1999) My War Gone By, I Miss It So. New York, NY: Grove Press, 43.